The winners of this year’s prestigious Wildlife Photographer of the Year Competition were announced today at an awards ceremony held at London’s Natural History Museum. Canadian amateur photographer Don Gutoski was named Wildlife Photographer of the Year 2015 by a panel of international judges for his image Tale of two foxes, a beautiful but haunting portrait of the struggle for life in the subarctic climes of Cape Churchill, Canada. 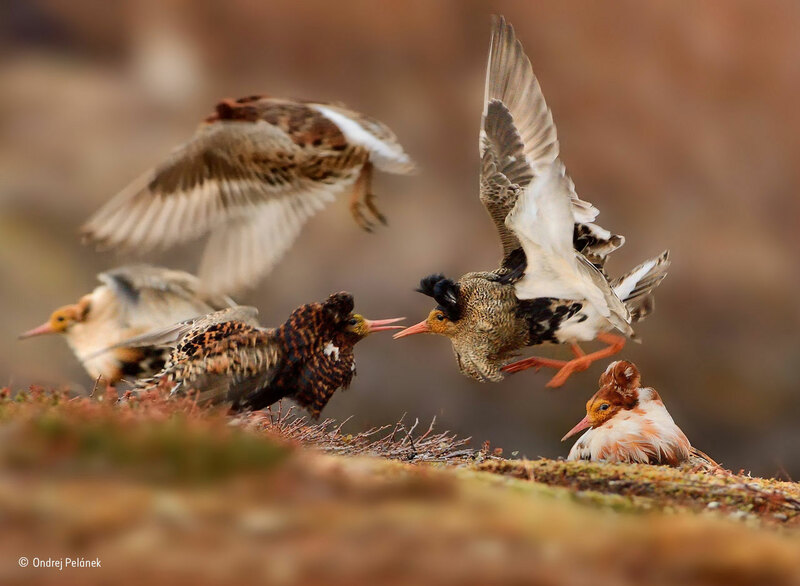 Beating more than 42,000 entries submitted from across 96 countries, Don’s image will take centre stage at the fifty-first Wildlife Photographer of the Year exhibition, opening at the Natural History Museum on 16 October. The acclaimed show celebrates the rich array of life on our planet, reflecting its beauty and highlighting its fragility. After its London premiere, the exhibition embarks on a UK and international tour, to inspire millions of people across the world to appreciate and conserve the natural world. It’s a frozen moment revealing a surprising behaviour, witnessed in Wapusk National Park, on Hudson Bay, Canada, in early winter. Red foxes don’t actively hunt Arctic foxes, but where the ranges of two predators overlap, there can be conflict. In this case, it led to a deadly attack. 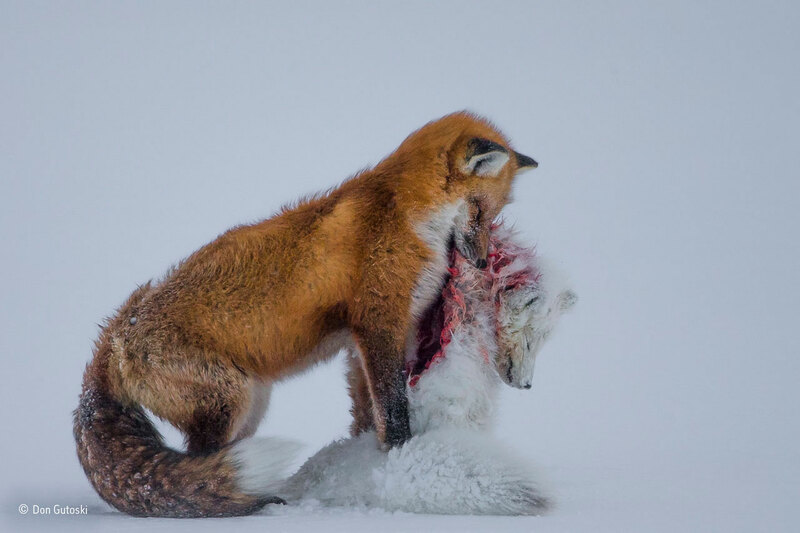 Though the light was poor, the snow-covered tundra provided the backdrop for the moment that the red fox paused with the smaller fox in its mouth in a grim pose. Jury member and National Geographic magazine’s senior editor for natural history projects, Kathy Moran says, ‘The immediate impact of this photograph is that it appears as if the red fox is slipping out of its winter coat. What might simply be a straightforward interaction between predator and prey struck the jury as a stark example of climate change, with red foxes encroaching on Arctic fox territory. The bottom line is, this image works on multiple levels. 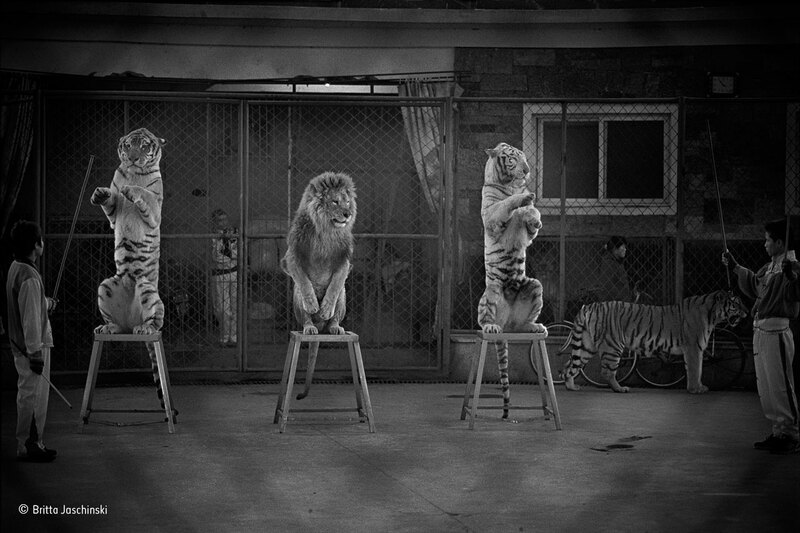 It is graphic, it captures behaviour and it is one of the strongest single storytelling photographs I have seen. Jonathan has been sailing round the world with his family for five years, and for the past three years he has been taking wildlife photographs. 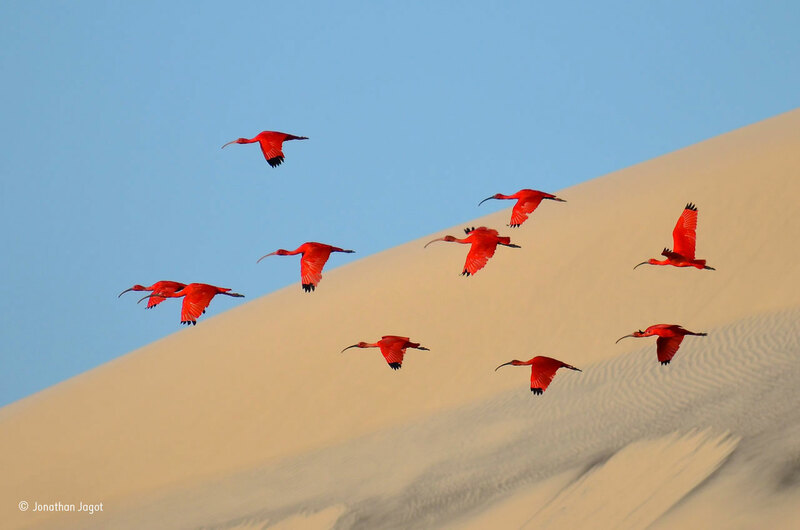 It was when they anchored off the island of Lençóis on the coast of northeast Brazil that he saw his first scarlet ibis – the most beautiful birds he had ever seen. He discovered that at high tide they roosted in the mangroves and that at low tide they flew to the mudflats to feed on the crustaceans and shellfish with their probing curved beaks. He learned their favourite feeding spots and when to expect them. But they were very nervous, and so he had to be careful not to get too close, and the pictures of them on the mudflats or in the mangroves were never quite right. Then he had an idea: he would photograph a flock framed against the beautiful dunes that the island is famous for. At low tide, he took his dinghy into an estuary at one end of the island, anchored where he had a view of the dunes and waited. As the tide rose, so did the ibis, creating a glorious pattern of scarlet wings against the canvas of sand and tropical blue sky. Nikon D5100 + 55-300mm f4.5-5.6 lens at 300mm; 1/1000 sec at f6.3; ISO 360. 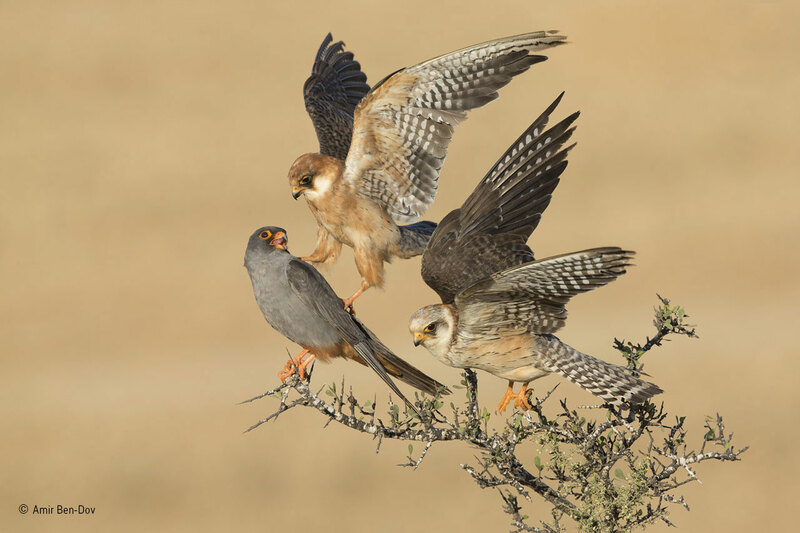 Red-footed falcons are social birds, migrating in large flocks from central and eastern Europe to southern and southwestern Africa. The closest relationships seem to be pairs or parents with first-year chicks, but otherwise, they maintain a degree of personal space. But these three red-footed falcons were different. Amir spent six days watching them on agricultural land near Beit Shemesh, Israel, where their flock was resting on autumn migration, refuelling on insects. What fascinated him was the fact that two subadult females and the full‑grown, slate-grey male were spending most of their time together, the two females often in close physical contact, preening and touching each other. They would also hunt together from a post rather than using the more normal hovering technique. As so often happens in photography, it was on the last day in the last hour before he had to return home when the magic happened. The sun came out, the three birds perched together, and a subtle interaction took place: one female nudged the male with her talon as she flew up to make space on the branch for the other female. Exactly what the relationship was between the three birds remains a mystery. Canon EOS-1D X + 500mm f4 lens; 1/1600 sec at f8 (+0.33 e/v); ISO 500. A great crested newt hangs motionless near the surface of the stream. Also motionless in the water, in Gelderland in the Netherlands, was Edwin in a wetsuit. 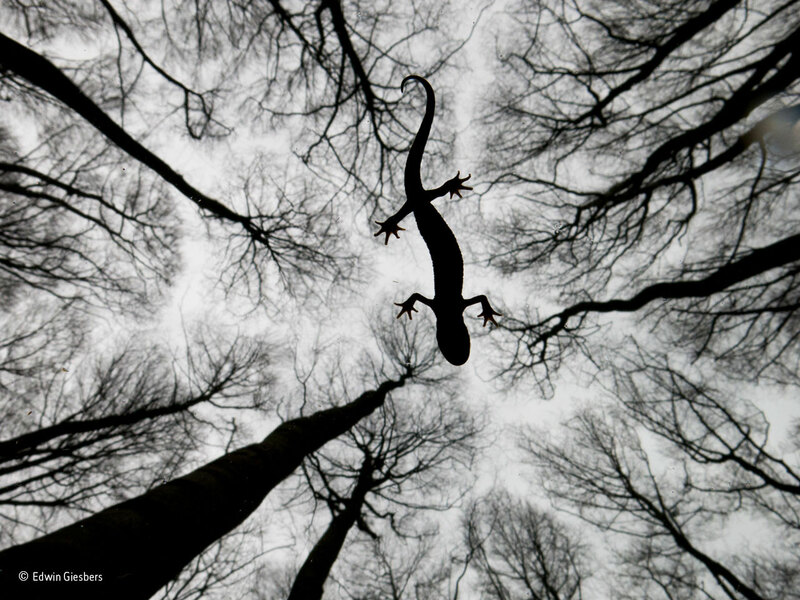 He had very slowly moved his compact camera right under the newt, and though he knew the shot he wanted, he had to guess at the framing and literally point and shoot. The male had just taken a breath and was possibly warming up at the surface. It was a cold April morning, and the trees were not yet in leaf, but it was mating time for these large newts, and the males were already on the lookout for females. Edwin took this shot as part of a major story on the threat facing amphibians throughout the Netherlands and Belgium: an Asian skin fungus similar to the one that has annihilated frogs and toads worldwide and has all but wiped out fire salamanders in the Netherlands. Scientists are bracing themselves for a collapse of European amphibian populations, unless some way is found to stop the fungus from spreading. Canon G15 + 28-140mm f1.8-2.8 lens at 28mm; 1/500 sec at f6.3; ISO 200; Canon housing. A Bryde’s whale rips through a swirling ball of sardines, gulping a huge mouthful in a single pass. As it expels hundreds of litres of seawater from its mouth, the fish are retained by plates of baleen hanging down from its palate; they are then pushed into its stomach to be digested alive. This sardine baitball was itself a huge section of a much larger shoal below that common dolphins had corralled by blowing a bubble-net around the fish and forcing them up against the surface. Other predators had joined the feeding frenzy, attacking from all sides. These included copper, dusky and bull sharks and hundreds of Cape gannets, which were diving into the baitball from above. The Bryde’s whale was one of five that were lunging in turn into the centre of the baitball. 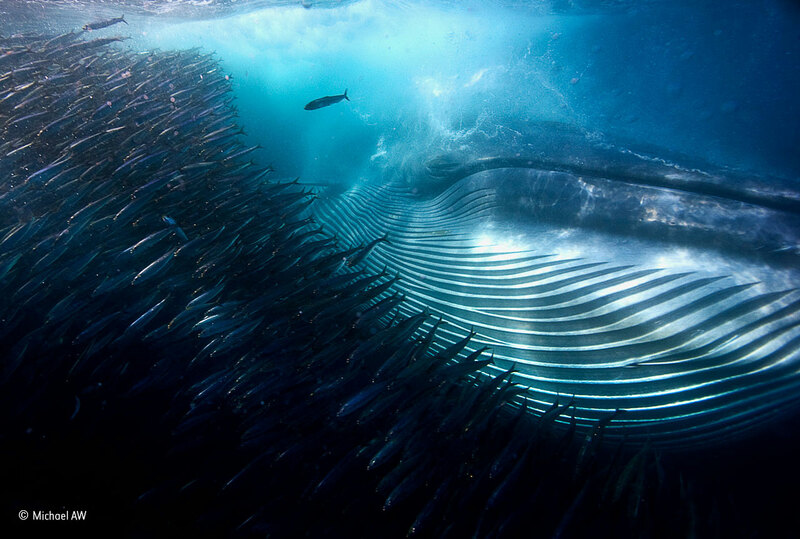 Michael was diving offshore of South Africa’s Transkei (Eastern Cape), specifically to photograph the spectacle of the ‘sardine run’ – the annual winter migration of billions of sardines along the southeastern coast of southern Africa. Photographically, the greatest difficulty was coping with the dramatic changes in light caused by the movements of the fish and the mass of attacking predators, while also staying out of the way of the large sharks and the 16‑metre (53‑foot), 50-ton Bryde’s whales, which would lunge out of the darkness and, as he knew from experience, were capable of knocking him clean out of the water. Nikon D3S +14-24mm f2.8 lens at 14mm; 1/250sec at f9 (-1 e/v); ISO 800; Ikelite DS‑200 strobe; Seacam housing. The Bahía de Cádiz Natural Park on the coast of Andalucia, Spain, is a mosaic of marshes, reedbeds, sand dunes and beaches, which attracts great numbers of birds, and in spring it is an important migration stopping-off point. Pere was there for the birds but also for a spring phenomenon, only fully visible from the air. As the temperature warms and the salinity changes, the intertidal wetlands are transformed by colour as bright green seaweed intermingles with multicoloured microalgal blooms. White salt deposits and brown and orange sediments coloured by sulphurous bacteria and iron oxide add to the riot of colour. The full display usually lasts only a few weeks in May or June, but it’s not possible to predict exactly when. 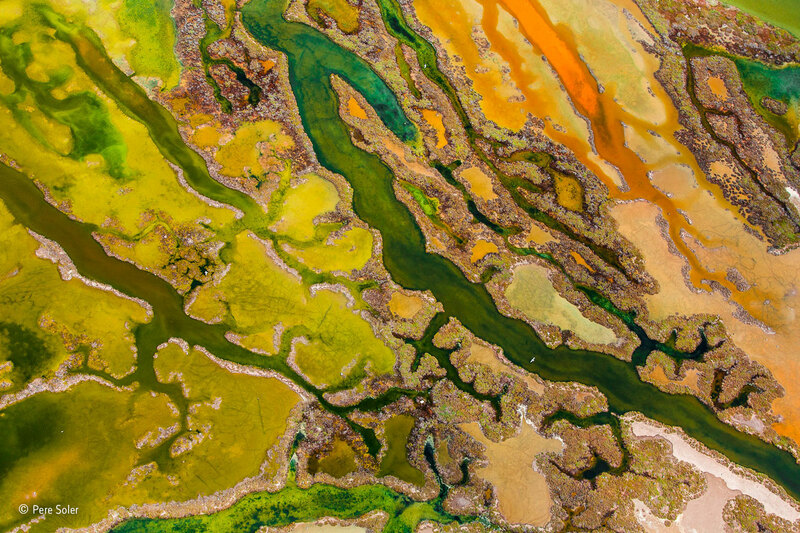 Pere took his chances in June, hired a plane and, at midday, when the tide was out and the light was overhead, he was able to photograph the rich tapestry of colour and texture. The spectacle was, said the pilot, the most beautiful he’d seen in many years of flying over the delta. Canon EOS 5D Mark III + 70-200mm f4 lens at 70mm; 1/1000 sec at f5.6; ISO 200. A snatched glimpse or a movement in the shadows is how most people see an urban fox, and few know when and where it goes on its nightly rounds. It was that sense of living in the shadows that Richard wanted to convey. 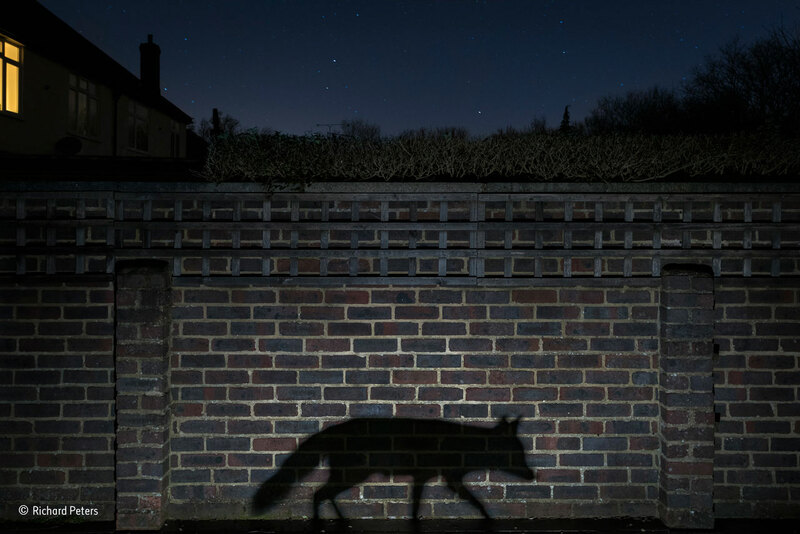 He had been photographing nocturnal wildlife in his back garden in Surrey, England, for several months before he had the idea for the image, given to him by the fox when it walked through the beam of a torch he had set up, casting its profile on the side of his shed. But taking the shot proved to be surprisingly difficult. It required placing the tripod where he could capture both the cityscape night sky and the fox silhouette, a ground-level flash for a defined shadow, a long exposure for the stars, a moonless night to cut down on the ambient light and, of course, the fox to walk between the camera and the wall at the right distance to give the perfect shadow. On the evening of this shot, the neighbours switched on a light just before the vixen arrived, unaware of her presence but adding to the image. Nikon D810 + 18-35mm lens at 32mm; 30 sec at f8; ISO 1250; Nikon SB-800 flash; Gitzo tripod + RRS BH-55 ballhead; Camtraptions PIR sensor. Every year, a pair of barn swallows nests in the rafters of an old storehouse on Juan’s farm in Almeria, southern Spain, entering the building through a broken windowpane. Equipment and tools are kept in the building, but the swallows seem unperturbed by people coming in and out. Last spring, Juan decided to try to take a very different image of the swallows. He first had to find the right painting to use as a prop – in the end choosing one familiar from his childhood. 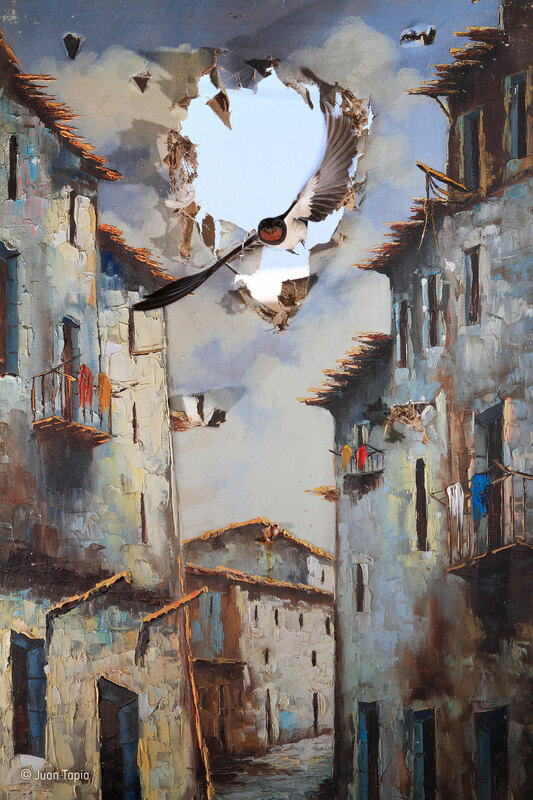 Making a swallow-sized hole in the oil painting, he moved it over the window that the swallows entered through. When the pair first arrived, they flew straight in through the window, unperturbed by the canvas. But rather than risk disturbing the birds that spring, he waited until the following spring to set up the shot. Using two flashes, both to light the canvas and to freeze the movement, he linked a remote control to his camera, which he positioned to shoot the entrance hole against the sky. He then retreated to his truck with his binoculars ready. He had no trip beam, and so it took 300 shots and 8 solid hours before he finally got the moment one of the swallows swooped in with the sky behind, as though it had punched straight through into another world. Canon 7D + 70-200mm f2.8 lens at 150mm; 1/250 sec at f14; ISO 400; Canon 580EX II and Metz 58 flashes; x2 Metz photocells; Manfrotto tripod + Rótula RC2; Godox remote. Nikon F4 + 24mm lens; 1/125 sec at f5.6; Kodak Tri-X-Pan 400 black-and-white film. The 2016 Wildlife Photographer of the Year Competition is open for entries between December 2015 and February 2016. Visit www.nhm.ac.uk for further information. The exhibition runs at the Natural History Museum from 16 October 2015 until 10 April 2016 between 10.00–17.50. Admission prices £15, with concessions available.